Which comes first – the music or the movie? I’ve yet to see the animated movie “Frozen” but the song “Let It Go” has become all but too familiar. Should you decide to find the sheet music, you’re in luck. There are numerous arrangements for all levels of players. If the original key of F minor (with four flats) is daunting, try taking it down half step to my version with one sharp. My arrangement is currently being tested by a young lady in Palo Alto. I played piano at her parents’ wedding many years ago, but I’ve yet to meet her. In mid-June, I taught a seven-year old boy how to play the lefthand of the first three pages while his nine-year old sister sang along in McClellanville, South Carolina. My students, of course, got a surprise for their mid-term — to apply music theory questions to my three-page arrangement (of the first part of the song). The new version (uploaded on July 1st, 2014) is the complete six pages — obtained by clicking on the sample first page below. Here’s a version with lyrics you could karaoke to (note the original key is half a step higher than the easy piano version). There are plenty of links to web pages with full lyrics to this song. If you would like to support such arrangements for easy piano, please order a CD of my piano solos or help spread the word. You might be wondering why I bothered to add rehearsal marks (A, B, C, D, etc) to this arrangement. I tell my students to study by sections – little chunks at a time. As I conduct my piano classes as ensembles, it’s also easier to find the section by calling out A, B, C etc. The next step, if I don’t get tired of this song, is to write a piano duet arrangement. Now won’t that be fun! I’m so pleased to see YouTube recordings of my arrangement of “Let It Go” with credits to me. Many thanks! I have to say, we tried to sing it during our “Oscar Winners” Jam Session in our ukulele club, but it is so very difficult for adults to sing at such a high range. We’d have to transpose to a key that’s more suitable for adults to sing. Transposing is just one of many skills we need to get the best out of our music making. I am scheduled to give a session on “Transpose to Compose” at the annual ukulele melee festival in Hamilton, MA. I have searched internet for hours and your Let it Go piano sheet is the best I can find for us beginners. I especially love that you also put the lyrics in the sheet. That is really helpful for us to figure out where are we at and if it sounds right. Thank you so much for posting this. Could you please finish the whole song? Your current version only covers the 1st part. We’d really appreciate it! Thank you, Cindy. Happy to finish the song when I have time, not sure when. You can help by supporting this project through purchase of our CDs on http://www.cdbaby.com search for Anne Ku or Bekkers Piano Guitar Duo and help clear our inventory so we can make time. I usually don’t leave comments but I feel compelled to today. Thank you so much for this version of Let It Go. My 6 year old loves the song and this is a perfect way to motivate her to keep at it with the piano practice! This will make piano practice much more enjoyable for the both of us! Thanks, again. Thank you, Susan. I always wonder who finds my music, who uses it, who likes it. As one of my students has chosen it for her final solo performance, I am compelled to finish it when I find the time. Enjoy! I agree, GREAT VERSION! But would also really love it if you finished the song…. 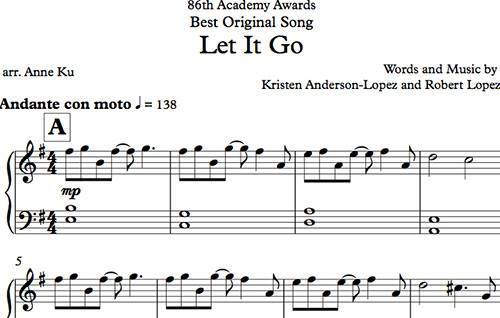 I’m not much of a musician and I’m trying to learn the full song if let it go, but I can’t read sheet music.if anybody knows where I can find websites with letters I would appreciate it. This website helped my sister with it so thank you!!!!! I have completed the arrangement for easy piano. Please click on the first page (image) shown in this blog post to get all six pages as PDF. Thank you for your requests. Feel free to share and support by ordering my original piano solo CD “In Pursuit of Flexibility” on CD BABY at http://www.cdbaby.com/anneku/ This will free up my busy schedule to arrange this song for piano duet and other popular songs. I love you, right now. thanks so much for this amazing song!!!!!!!!!!!!!!!!!!!!!!!!! Thank you, my little boy is asking what position this is in…i don’t know what that means? can you help please? This version is great, thankyou. It is in E minor. Hice un trabajo en lenguaje Scratch con “Let it go” con sonidos e instrumentos de Scratch. can you do it with numbers.and thank you !